The retired US space shuttle Endeavour has finally reached its new home in Los Angeles' museum after long delays caused by trees along the route. It took the spacecraft that once reached 17,000mph (28,160km/h) three days instead of the expected two to travel just 12 miles (19km). Hundreds of trees, traffic lights, power lines and parking meters were removed to clear the path. Thousands of city residents turned out to see it pass. Endeavour began its journey from Los Angeles international airport on Friday and finally arrived at the California Science Center. The 75-ton spacecraft entered service in 1992, making 25 trips, logging 123m miles and circling the globe almost 4,700 times. Replacing Challenger, which was destroyed in an accident in 1986 that killed seven astronauts, Endeavour was the baby of the shuttle fleet. Nasa took its shuttles out of service last year in order to focus on destinations beyond low-Earth orbit, such as asteroids and Mars. 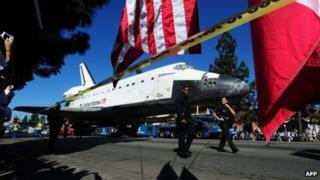 For its trip across Los Angeles, Endeavour was placed on a 160-wheeled carrier which was guided by remote control. It set off on Friday from the airport, where it had arrived three weeks ago aboard a specially equipped Boeing 747. After an early bumpy ride, it was backed into a shopping centre car park in the city's Westchester neighbourhood as crowds cheered. A delicate task was accomplished around midnight Friday local time (07:00 GMT Saturday), when Endeavour crossed a bridge over the Interstate 405 highway. Crews had spent hours transferring the shuttle to a special, lighter towing dolly, which was then pulled across by a pickup truck. When the journey resumed in daylight, the operators soon found themselves up against trees, despite the advance removal of 400 along the route. Most of the "problem" trees could not be cut down because they were old or were treasured for other reasons - some had been planted in honour of Martin Luther King. Crew members had to come up with creative solutions such as dipping a wing under branches, cutting them off or raising it over the trees. Longer than expected maintenance of the carrier and other physical obstacles such as lamp-posts and building edges added to the delays. However, spectators generally remained good-humoured throughout the spacecraft's journey. The shuttle passed down many streets that were in flames two decades ago during the Rodney King riots. "Having a shuttle come through this area of high poverty, it can only be a good thing," said bookshop worker Damian Pipkins. "It's pretty neat to see a spaceship in the street," a spectator told local TV elsewhere. Former shuttle commander Mark Kelly, who captained Endeavour's final flight, said he hoped the spacecraft would become an inspiration for future generations of astronauts. "Maybe some day one of these kids that see Endeavour, look up at it at the California Science Center, will be that person that walks on the planet Mars?" he told US broadcaster CNN.